KRYTAC, established in Southern California in 2013, is a dedicated product research and design team of the Switzerland-based firearms manufacturer KRISS Group. The primary focus of KRYTAC is to engineer premium airsoft products for recreational use. Additionally, KRYTAC also specializes in the advancement of cutting-edge professional training systems. The KRYTAC team is comprised of highly experienced firearm and airsoft professionals who have come together for one common goal: to provide premium products that evolve individuals beyond their boundaries. With the War Sport LVOA-C AEG, they have created a powerful, genuine airsoft weapon that will bring down opponents from long range. The KRYTAC brand name is derived from the legendary sea creature The Kraken. The Kraken was feared, and revered, for its power and dominance in the sea. No other creature could match The Kraken in strength and speed. The spirit of The Kraken lives on in KRYTAC and in this beefy M4 Carbine. 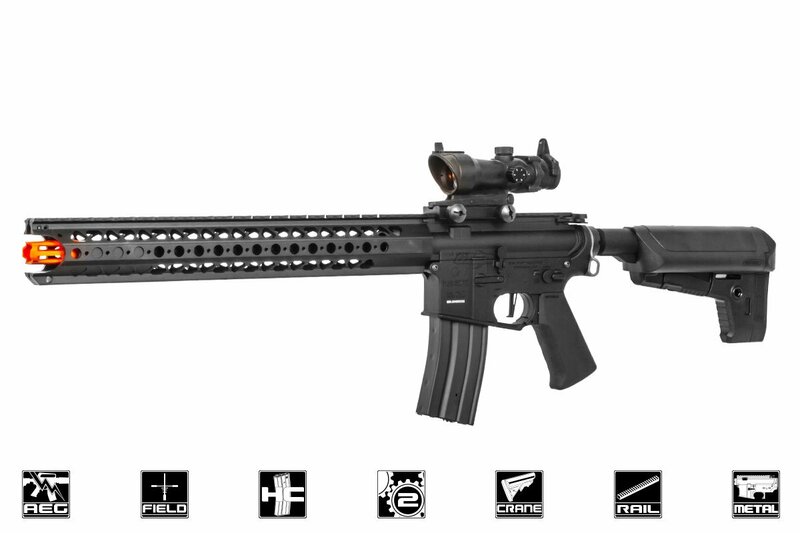 The KRYTAC LVOA-C, officially licensed by War Sport Industries LLC, is the pinnacle in M4 airsoft rifle design. 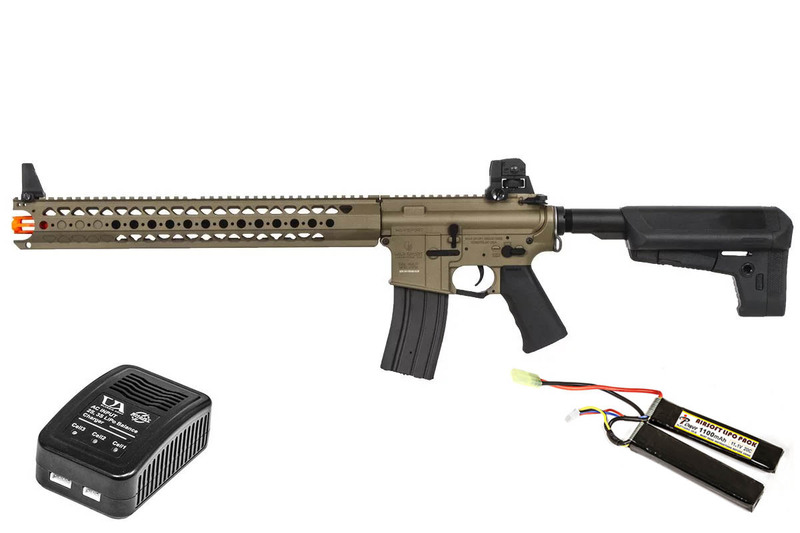 It starts with aluminum alloy receivers that feature authentic War Sport Industries and LVOA markings. 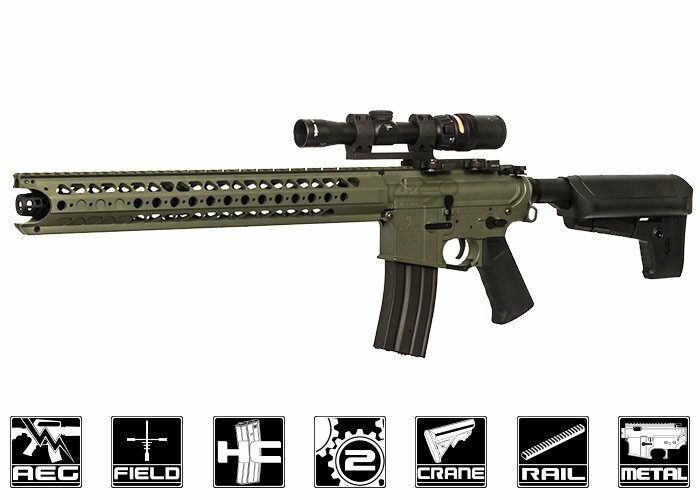 The unique LVOA hand guard and DEFIANCE TR113 rail system provide the user with tactical flexibility and numerous customization options. The War Sport Top Hat flash hider completes the authentic look and sits flush with the end of the rail. Additional features include the KRYTAC Trident pistol grip, removable iron sights and a KRYTAC 6-position adjustable battery stock. The fire selector is ambidextrous and the locking bolt plate provides easy access to the KRYTAC rotary hop-up. This system can be adjusted to 15 unique positions for everything from CQB to long-range snipping. The KRYTAC LVOA-C is the only officially licensed LVOA AEG by War Sport Industries LLC and is faithfully designed to be the ultimate field rifle. Internally, the KRYTAC War Sport LVOA-C features many of the same advancements seen in all of their airsoft AEGs. 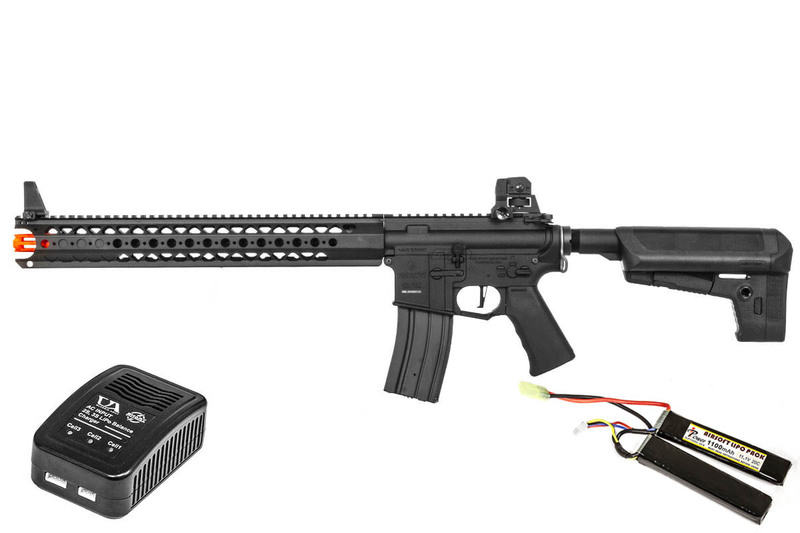 A reinforced 8mm ball bearing gearbox is built with integrated MOSFET to regulate electronic signals and to protect the trigger contacts. The corners of the gearbox that surround the cylinder feature a smooth radius, as opposed to a 90-degree angle, to prevent fracture. Also, the gearbox shell features a small window on the left side where lubrication can be applied directly to the gears or piston. This window can be used for inspecting the angle of engagement with the gearbox fully assembled. Additional gearbox features include a modular spring guide system that will allow the spring to be changed without completely disassembling the gearbox. The KRYTAC piston is made of a durable, lightweight polymer and features four metal teeth with the 2nd to last tooth absent. The cylinder head is padded with an enlarged rubber bumper to optimize the angle of engagement and to absorb energy from the impact of the piston assembly. The material for the gears have been especially formulated to be very strong - Rockwell test figures on the KRYTAC gears are much higher than industry norms. Turning all of the drive train components is the KRYTAC high-torque motor capable of 30,000 revolutions per minute unloaded. 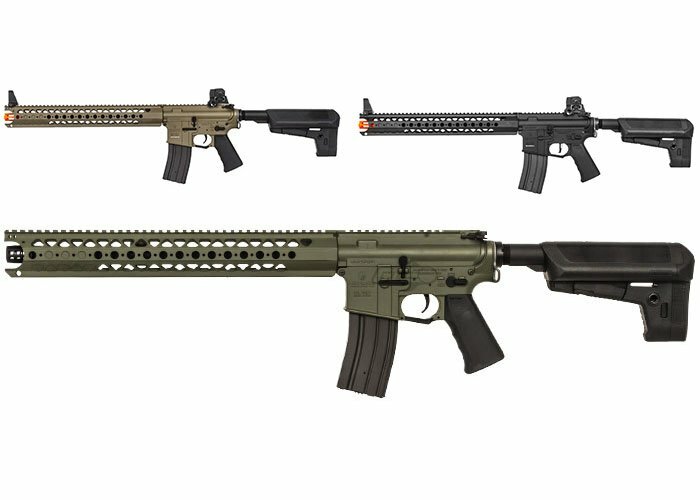 The KRYTAC LVOA-C is an amazing rifle and will outperform most rifles straight out of the box, with 380 FPS capability and a solid manufacturer's warranty. The LVOA-C is a very versatile platform that excels in both close quarters and mid- to long-range engagements. Airsoft GI has this incredible airsoft platform in three colors for matching your team or environment colors. This gun is fantastic. I stepped into the GI Tactical store in Texas and tested this thing out. I immediately just had to purchase it. The trigger response was fantastic. I have never seen, or felt such a crisp trigger response from a stock AEG. The fire rate was right around 22 RPS with an 11.1 LIPO battery, which is excellent for a stock AEG. The gearbox is high quality, and will last a very long time. No upgrades are necessary, however it is very easy to find parts for, as it is a standard version 2. The rail system is solid, and is easy to remove for maintenance. Just loosen two screws on the bottom. The OD green paint job is beautiful, and high quality. It does not scratch easily, and is a good change of pace from the standard tan or black you see all over the field. The range is great, even with a stock barrel and hop up bucking. I was able to maintain a 5 inch grouping at 100 feet with ease. I was able to maintain effective accuracy out to about 200 feet. The pistol grip is comfortable, and clean looking. The stock has little wobble, and is very comfortable to shoulder. The battery is easy to access, and the back of the stock that pops off is secure, so it wont pop off during intense play. The bolt catch makes adjusting the hop up a breeze, since you don't have to hold the charging handle back to access it like you do on most M4 platforms. The hop up adjustment wheel clicks into place nicely, and is numbered! You can take note of what setting works best for different weight bb's, and it makes adjusting simple. This is a great out of the box gun. There is no need to perform upgrades, though you can easily do so if you wish. I had only one issue. If you run KWA K120 mid cap mags like I do, you will have to file the little nub on the magazine catch a bit for them to sit in firmly without dropping out. I bring this up because they are a very common magazine from what I've seen. Very small issue, and only takes about 5 minutes. 5/5 stars. I am very impressed with this Krytac build. Absolutely none. This is a high level AEG, with a custom build quality. It runs like a professionally tuned AEG right out of the box. I bought some standard M4 mags for this gun and they won't lock into the gun so I can't use them at all. What would be a recommended brand of M4 style mags to use for this gun? I would recommend KWA K120s in Krytacs, although most standard M4 mags should fit. 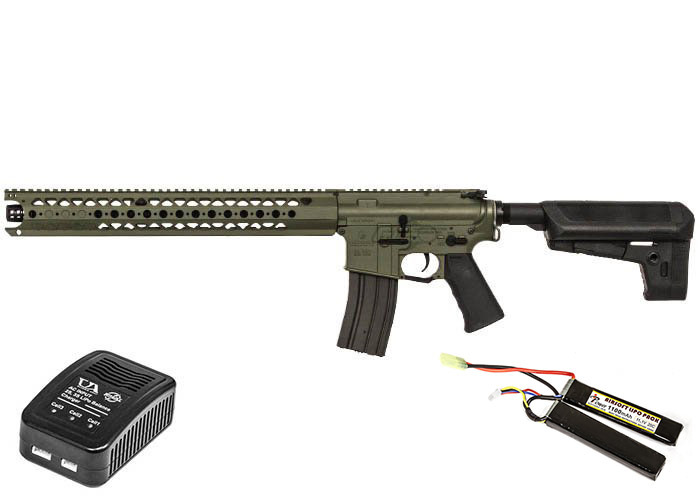 Most standard 11.1v lipos will work with this gun. A stick type 1000-1200mah 11.1v battery wired to small tamiya will work best. Does it come with the black top hat flashider? Does the lvoa come with only a orange tip or does it come with a black one? It does come with an additional flash hider.